KEBAYA and history, following the passage of time to adapt to the times and has a long history dating back to 15th century AD. In terms of history, the kebaya is the formation of the clothes worn first chief Indonesian women, particularly women of Java. However, in the late 19th century, kebaya dress is also popular as Dutch women who need clothes that fit the tropical climate of Indonesia. In addition, the kebaya has also been popular among women in China to bring up the term Peranakan kebaya. Over time, the kebaya has changed and eroded the times. Especially in the period of Japanese occupation, where creativity and productivity of the nation is pressed down to the lowest level. Japanese occupation of Indonesia cut textile trade routes and their support team finally closed a lot of production houses kebaya and batik, which few companies can survive. However, with time of kebaya reemerged keterpurukannya, along with the proliferation of batik. Calling fashion house Prajudi Iwan Tirta, who contributed large preserve national costume, so that the kebaya also always kept in the hands of the next generation. Now, another youth of the nation who want a long career in a history book kebaya. André Frankie through The Art of Kebaya, Kebaya trying to document the journey in the form of descriptions, drawings and photos, including photos of kebaya circuit modifications. André also made extravagant designs showing the art of a kebaya hand sewing techniques. In a book as thick as 176 pages, André also invites readers to find the secret behind the process of creating a hand berjahitan work. In the field of fashion, Andre Frankie is not a new name. Teaching students making institutions that Susan Budihradjo began struggling with the art of designing kebaya since 2000. "I call this as kebaya, kebaya kebaya haute couture manufacturing techniques only. 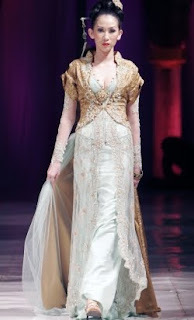 The connection to the parts of the kebaya is not immediately apparent and all the work by hand, so one could pass within one month kebaya" Andre said. Through his book, Andre is also trying to show that today's modern kebaya not infringe grip. However, the form-fitting development trends. "Some say today's modern kebaya violate the hilt. Throughout the book, I wanted to show that the design kebaya not destroy the beauty of my heritage, which evolved from a classic and not so monotonous tinggil" he said. He said: "That way, kebaya today can reach more among users, not limited to tribal, ethnic, and citizens," said Andre. For that reason, nor do they cause André made use of professional models, but the high society and love as the model kebaya. The models appearing in fashion in the art of the Kebaya Ballroom Four Seasons Hotel, Jakarta, is the Goddess Soedarjo, Karlina Chandra, Maya Ludy, Malinda Dee, Anton Metta, Miana Sudwikatmono Patty Siahaan, Joseph Sendy, Titi DJ and the diva. Meanwhile, Jero Wacik Trisna in his speech said he was proud of the youth of the nation who care about the country's culture. "I welcome the efforts to preserve Frankie Andres kebaya through a book of documentation. I hope this book encourages other people to participate in cultural and tourism potential of Indonesia," he said. July, Selena Gomez launches fashion line!